I'm about to start another best of seven series. This series will be against the Milwaukee Bucks. Before the series gets started, I wanted to do a quick breakdown of what I am thinking before I begin it, so you can see the kind of planning I'm doing to prepare for it. I'm on the PS3 and in this series, I'll be facing PSN user sreckless. Sreckless recently defeated me 0-4 when he used the always tough Boston Celtics. On paper, the edge in this series seems to favor the Pacers but I'm certain that he will be just as tough to beat as the Milwaukee Bucks as he was when he used the Celtics. I know he'll be spending time putting together a solid game plan to beat me. And, since he knows this Pacer team and how I like to use them, that will make it even tougher for me because he is already familiar with my roster. In my case, I have to prep for a whole new team. The Bucks are in the Eastern Conference, so the series will follow a conference finals format of 2-2-1-1-1. As is customary, I have the home court advantage with the Pacers. The settings we will be using are Hall of Fame, simulation mode and 12 minute quarters. I haven't played the Bucks before so the first step for me is to start to start looking at their roster and see what's in store for me. I like to break down each position and see what kind of offensive fire power they have. The Bucks have three guys on the roster at point guard. The starter is Brandon Jennings and I'll expect to see a heavy dose of him during the games we play. I wouldn't be surprised to see Udrih come in at all since he it looks like he can shoot pretty well. I don't expect to see Livingston but that doesn't mean I won't. I'm pretty sure sreckless uses manual substitutions. There's a good chance Jennings might go the whole way barring foul trouble. I like to go into practice mode and have a look at each player's hot zones. Here you can see that Jennings is mainly deadly from the left corner so I'll need to be aware of that. Since he is the point guard, he'll be spending most of his time near the top of the key early in the shot clock I'd assume. I just made a note to myself to check the Bucks and see who brings the ball up. He is still a threat from three so I can't leave him open. I'd also suspect that Jennings will be used to drive to hoop but unlike Rondo in the last series, he won't be as effective near the rim as he was - especially if I can get Hibbert near him. But he has a lot of great abilities so he will be a handful. Udrih's hot zone chart is a little redder. He is particularly effective within the free throw line area and in. If it were me and I'll played Udrih, my first option would be to get him in the lane and get open looks if I could mainly because he is so highly rated in there. Otherwise, he's a decent shooter if he is open from the rest of the court. It will be important if he plays to guard him because of that. Even though he isn't rated as high as Jennings, he doesn't lose a whole lot except for some quickness if he does use him. The last guy on the roster listed at point guard is Livingston. It looks like he can shoot inside and decent from mid range. It's not to say he doesn't have skills though. I've certainly seen scrubs play awesome before so anything is possible. At shooting guard is their premiere player in Monta Ellis. The backup is Mike Dunleavy. I don't expect to see him much unless for some reason Monta would get into foul trouble. My assistant coach "The Kid" did a create a legend with Monta and he was awesome. He's a good shooter and with a 91 inside rating is a good finisher. A look at his hot zone chart shows him to be a better three point shooter at the top of the key and if I am going to give up some shots to him, it would be best if I shaded him to the right side of the court where he's a little colder over them so that's going to be part of the challenge. Stopping Monta from killing us is our first goal. While we won't stop him completely, we can try and limit him and keep his shot percentage below 50 percent. Now it's here I might suggest to my opponent that he start Mike Dunleavy in Monta Ellis' place but I doubt he will take me up on that one..lol. If he wants to beat me with Dunleavy, I'll take my chances. One thing is for sure though, Mike Dunleavy can shoot so I will have to guard him. In checking with "The Kid" he tells me that the small forward spot isn't that strong of a position for the Bucks. There are three small forwards on the roster with Mbah A Moute being the starter. I could see all three of these guys seeing action. I am expecting I will see Delfino since he is a little hotter on the three from the corners but then isn't everybody? Personally, I'm worried about the small forward spot because they aren't highly rated. I have played enough teams that have destroyed me with guys that they shouldn't. So, I will not be surprised if he gets some scoring from this spot. The Bucks are packed at power forward carrying six guys at the power forward spot. Because of this, you can slide some of these guys into the small forward slot and to center. So, it's going to be interesting to see what he does with his lineup. The Bucks are pretty weak at center with Kwame Brown. I think Ilyasova will provide sreckless some additional 3 point shooting which he likes and most likely start Gooden at the center spot. It will be a pleasure to not see Kevin Garnett down at center in this series. In looking at the Bucks and how they like to play, I started by looking at their playbook. I noticed that it is heavy on pick and rolls. I don't recall sreckless using the pick and roll much in our last series so it will be interesting to see how he approaches the game. I know that he is used to using Rondo to get to the basket and Jennings certainly has the skills to get into the lane and find open guys. I know that in our last series, sreckless studied his play book to see what kind of gems he could find. Will he go to the pick and roll this series. That is yet to be seen. The one thing I think is interesting about this upcoming series is that he is really strong at guard and the Pacers have a dominate low post game. In a way, each team is the flip side of the other. That's not to say that the Pacers guards can't play, but on paper look weaker and I know sometimes against stronger competition they feel a lot weaker when I use them. As always, I'll need strong play from everybody to pull out a victory in this series as methodical as sreckless is. Since I've yet to beat him, I'll claim underdog status. Game one is scheduled for Saturday morning. 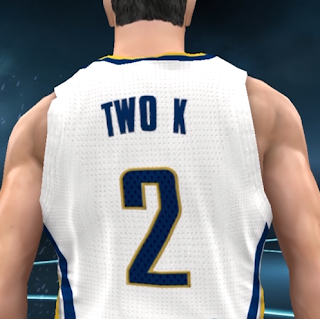 I recently started a challenge with my NBA 2K12 readers which I call Coach2K's Best of Seven Series challenge. I started this challenge because when I was younger my friend and I would always play Tecmo football and we would always pick a team from opposite conferences, play a season and meet in the Superbowl. The NBA season is pretty long so we never did a complete NBA season but we would always play a best of seven series like it was the finals and whoever won had bragging rights. I always found these series to be pretty intense and we always had to shoot like 80% to win. If you missed a few jumpers, it was so hard to come back. To recreate that I started my challenge and this article represents my first in a series of articles about breaking down the game to figure out how to win against my opponent. The first breakdown is on analyzing your opponents hot zones and shot ratings. The settings we are using are Hall of Fame, simulation mode and 12 minute quarters. Usually everybody plays 5 minute quarters in quick match, so the idea here is to create a more demanding game in which players might get in foul trouble and maybe get tired. Because of that, it might make it so that you have to rely on your bench in key moments of the game - something you don't have to do really on 5 minute quarters. If you have read my stuff, you know that I will be playing the Indiana Pacers for all of my games. My first opponent is PSN ID sreckless. He is using the Boston Celtics. Since we are both Eastern Conference teams, the series format will mirror an Eastern Conference finals with two games in Indy, two in Boston and if necessary one in Indy, one in Boston and finally one in Indy. Boston is going to be a very challenging matchup because the Celtics have a bunch of weapons both inside and out. It's going to be hard to stop everyone. The first step for me when I break down and opponents game is to look at where each players hot zones are and who has the best shot ratings on the team. My first few of these were pretty basic. I made a basic chart with some baskets on it. I'd go into freestyle practice mode, choose a team and choose each player and bring up their hot zones. I had some colored pencils and my assistant coach "The Kid" and I would go through and see where the hot zones were. To the top is my first basic one of these. You can see it was pretty simple. This one was for the Clippers. The first one of these I created was for my Pacers. I used it to get use to where I wanted to shoot. Now, I pretty much have those spots memorized. When it comes to my opponent though, I don't necessarily know them by heart, so I make one I can look at during the game. In my pursuit of learning to play better defense, the first step is to do my best to get people out of those zones. For my matchup with Boston, I went in and recreated this idea and fancied it up a little bit with the actual pictures from the game. A snippet is to the right and you can view the full shot chart here. In looking at Boston, I realized a few things that intuitively I knew but confirmed from my hot zone and shot ratings research. Ray Allen and Paul Pierce are deadly from three. Rondo is the worst shooter. My goal in playing defense is to get my opponent to shoot with the worst shooter on the floor. That would be Rondo. And to challenge every shot that Allen, Pierce and Garnett take. In my next article, I will talk about how I decided to set my defensive settings but in the meantime, here's a video where I discuss my thoughts about this first step. I was browsing the NBA 2K Sports Forums and noticed a thread about My2K Rank. It talked about what everybody's My2k ranks were and what they meant. A question was asked about how do you get your My2K rank to a Hall of Fame level. In the picture to the right, I thought I would show you my badge so you can see proof that I really indeed did get the Hall of Fame badge. I think whenever you read anything online about NBA 2K12 that you really question the information you find because a lot of people say stuff that's just not true. It then gets spread around the internet like it is fact. In the forums over at 2K, I was the only one who said they had achieved Hall of Fame status. This got me to thinking that it must be a lot harder to achieve than I thought and therefore mean a lot more than I thought as well. The funny thing is that I've had it for months. Well, I say I, but I'm sure that "The Kid" had a big part in it as he played a lot of the modes that probably helped us reach that status. So, it also got me wondering exactly how to raise your My2K rank and build it to a Hall of Fame level. No one really seemed to know. Fortunately, I have been sending all of my achievements to my twitter feed. Here's a picture of my twitter feed the day I picked up the badge. I didn't realize it but I've actually raised my 2krank to Hall of Fame level badge twice according to my twitter feed. Here's the announcement the second time. This probably had something to do with the freeze issue or online problems I'm guessing. There are several My2K rank levels you have to reach. Everyone starts out as a Rookie. The next levels are Pro, All-star, Superstar and then finally the highest My2K rank level of Hall of Fame. Each My2K rank level, except Hall of Fame has certain numbers like Pro 1, All-star 2, etc. I think there are 4 or 5 levels to each badge. How long did it take for me to get my My2K rank to Hall of Fame level in NBA2k12? It took me exactly 102 days. Completed the NBA's 15 greatest games. I personally think that in order to get your Hall of Fame My2K rank, you have to play a bunch of games, achieve several milestones and play (but not necessarily complete) all the modes in the game. For example, I didn't complete training camp until after I got my badge but I'm not a 100 percent sure. My suggestion is to make sure that you play a lot of games and do something in every mode in the game. It is also possible that the downloadable content I bought had an impact on that, but I'm not saying that as fact. We didn't achieve Hall of Fame level until after Christmas when we got that to check out. It could just have been a matter of timing. I'm not sure if it mattered. We didn't tweet all of our achievements to the twitter feed, but if you want to look back at all our tweets by checking out Coach2K's twitter feed. You might as well follow me while you are there if you have a twitter account.